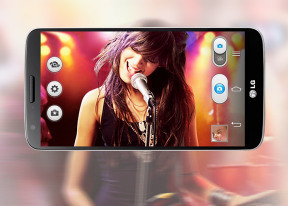 The music player on the LG G2 also looks much like the one inside the Optimus G and the G Pro. The interface is simple, easy to use, but still offers a lot functionality. A press and hold on the album art will bring up a search menu, if you need to look up the title, artist or the album. After that you can pick where to search - your music collection, YouTube or a general Internet search. Flipping the device to landscape mode while on the Now playing screen squeezes in a list of other songs by the same artist. There are equalizer presets and you can even create custom ones. 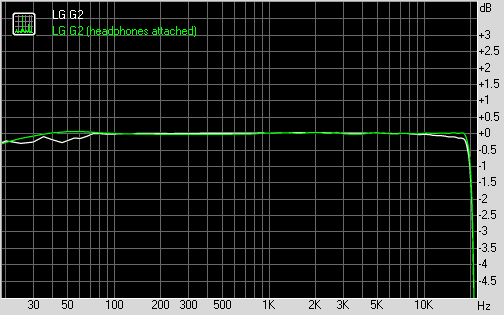 The LG G2 showed nicely clean output in both parts of our traditional audio quality test. The smartphone got pretty decent scores, but was led down by its volume levels, which were only average. The scores stay close to perfect even when you plug in a pair of headphones. The stereo crosstalk worsens a bit but the rest of the readings are virtually unaffected (frequency response actually improves a bit). Unfortunately, the volume levels remained just as uninspiring. The video player on the G2 has a fairly simple interface, giving you just a grid of all the videos on the device. There's an alphabet scroll to help users locate videos faster but that's about it. You can, of course, play videos from the Gallery if you prefer its folder-centric organization. For each video you've started, the thumbnail gets a tiny clock icon, which shows how far into the video you are. The interface during playback is nothing overcomplicated, yet it's quite powerful. The live preview feature is back - it's a YouTube-like pop up preview of the video above the scrubber. To get the basics out of the way, the available controls during playback include a scrubber for jumping to various parts of the video along with the standard play/pause and skip buttons. There's a pop-out button at the bottom right corner too, indicating that the app is part of the QSlide functionality on the Optimus UI. LG have implemented MX Player-like controls too - a swipe left or right will move the video forward or backwards, while a swipe up or down will tweak brightness. One of the new additions is a Video Speed control (you can set values from 0.5x up to 2x). There's a lock button too, which hides all controls for pure full-screen viewing. Another cool feature in the video player is Live Zooming. You can zoom in (with the familiar pinch gesture) during playback and some serious magnification is allowed, not just a quick resize or fit to screen. The LG Optimus G Pro handled everything we threw at it - DivX, XviD, MKV and MP4/MOV up to, and including, 1080p resolution. The AC3 audio codec (among lots of others) is supported, so you don't have to worry about the sound. There are were no issues with higher bitrates and file sizes, either. The video player also supports all popular subtitles formats. You can open subtitles manually in case the subtitle file is not using the same name as the video file. Non-Latin subtitles are supported as well and there are the usual options of choosing the font, color, size, etc. LG took Samsung's pop-up play feature a whole lot further with QSlide. In the latest Optimus UI iteration, LG has added a new batch of apps that take advantage of the functionality. Those include the web browser, Memo, Voice recorder, Calendar, Calculator and more. Furthermore, you can launch any of them from the notification drawer. There's an FM radio on the LG G2, which can play over a set of headphones or the loudspeaker, but the headphones need to be plugged-in either way (they act as an antenna). You can also scan for radio stations, and save up to six channel presets. There is RDS support just fine.